Snippet’s Writer Dashboard Launches Today! I’m excited to be over at Chip MacGregor’s blog today talking about the exciting news that Snippet–a brand new publishing and reading app–is moving their Writer Dashboard from private beta to open beta! Even though Snippet has already gained thousands of readers, it’s still new, so I’ve included some information in my post about my own experience and about Snippet in general to answer questions you might have, so head on over to Chip’s and check it out! If you’ve always wanted to write a book, or you have a story in you that you’d love to share with others, request access to Snippet’s Writer Dashboard and begin creating your own Snippet at any time. And if you have any questions, feel free to leave a comment and I will do my best to answer them! And if you want to see what a Snippet looks like, mine is free for a few days in the Snippet store so you can check it out. 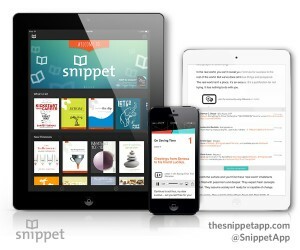 -Simply go to the app store and download Snippet App for free onto your iPhone or iPad. -Then scroll through the store and tap on Finding Mommy Bliss to download it. Posted in books, Finding Mommy Bliss, writing | Comments Off on Snippet’s Writer Dashboard Launches Today!